If all four strings need to be changed, you should change each string separately, one after the other. Please, never remove all four strings at once because the sound post can slide out of place or become loose. Before fitting the new string into place, you should rub graphite (use a soft pencil lead) onto the the grooves in the bridge and the top nut. That will make the strings fit more smoothly and reduce unnecessary wear. Put the string through the peg hole so that about 2 mm of its end are visible. Wind the string towards the side of the peg-box which is opposite the peg head, and then cross over and come back in the other direction. The string should be tightly wound, and it should not touch the side of the peg-box. The cross-over of the winding helps to prevent the string from pulling loose. Afterwards, the stance of the bridge should be checked (perpendicular to the instrument top). When pegs no longer turn well, or cannot hold the tension, it may be that they do not fit right. Perhaps they are not perfectly round, or their cone shape does not match the hole in the peg box. If this is the case, a master violin maker should definitely be consulted. However, if there is a lack of lubrication, then you can service the pegs yourself. Just as with the strings, you should never treat all the pegs at once, but rather one after the other. So, loosen one string, grease its peg, and then tighten the string back to the correct pitch. This will maintain the pressure on the violin body which keeps the sound post from slipping to another position or becoming loose. 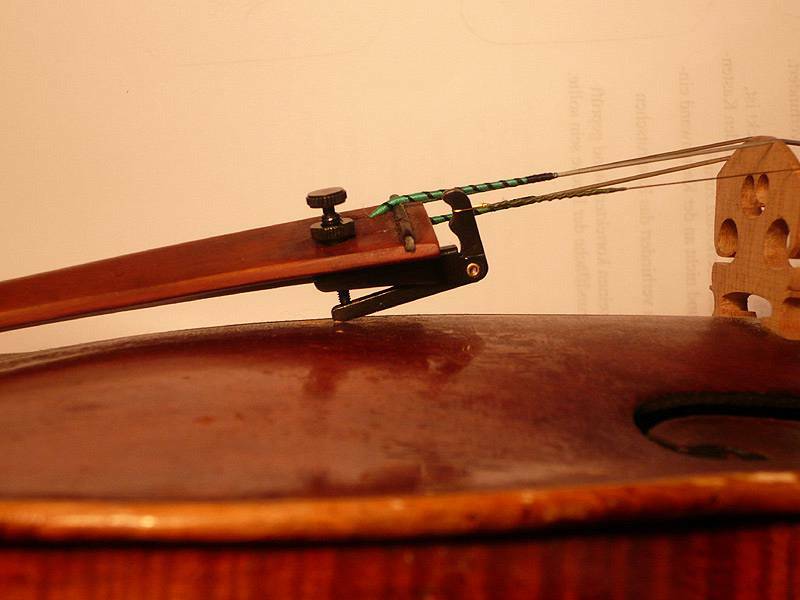 After tuning the string, always re-check the bridge stance to make sure it is perpendicular to the violin top. For this, you need a piece of dry soap and some blackboard chalk. First, rub the contact surface of the peg quite strongly with the bar of soap. Then insert the peg into the peg hole and rotate it (about ten times forwards and backwards). Exert some pressure on the peg sideways while turning it, but aways with feeling. Repeat the soap-smearing process several times until the peg turns easily and smoothly. 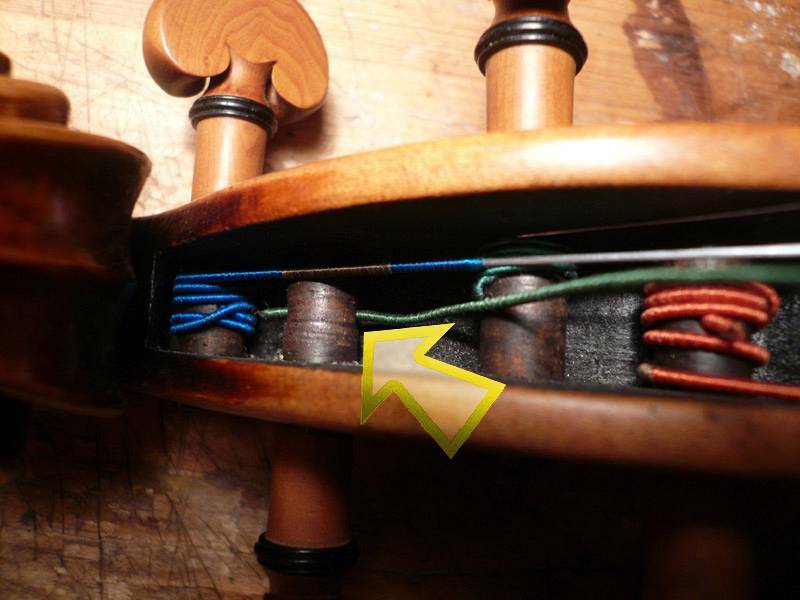 In order to make sure that the peg does not turn backward due to string tension, and to keep the instrument in tune, now is the time to put chalk on the contact surface of the peg. Please, put on only enough to allow the peg to continue turning smoothly after being rotated it in both directions several times. If the peg still does not hold the string tension, put more chalk on it. You will soon get a feel for the right mix of soap and chalk. However, do try to avoid loosening and tightening the strings too often, as that could harm them after a while. A common problem is damage to the belly under the fine-tuner(s). If you look under the tailpiece regularly, you easily can see if the fine-tuner screw needs to be screwed in, back away from the belly, and the string re-adjusted with the peg. Do not wait until the tuner comes all the way down onto the belly. By reacting in time, you can avoid expensive repairs. After using the peg to adjust the string, do not forget to re-check the perpendicular stance of the bridge. 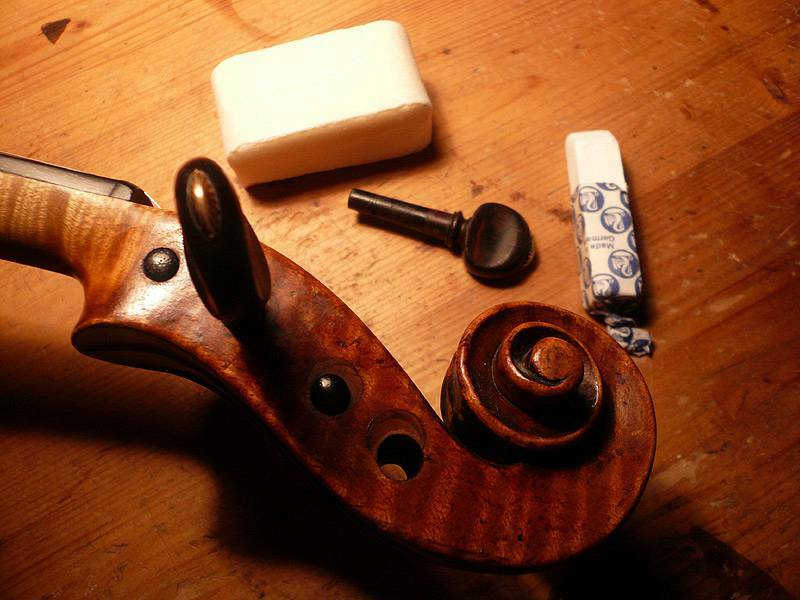 Much of the damage on the edge of the violin back and on the ribs comes from worn-out rubber casing on shoulder rests. This is also where a regular check of the rubber protects your instrument and your checkbook! Always replace torn and porous rubber casing immediately. New casing is available in violin shops. When you are playing the instrument, make sure that no zipper, button, or jewellery is touching it. Each time you have finished playing your instrument, you should use a soft rag to wipe the resin off the bow stick and frog. You should also wipe away the fine powder under the fingerboard and tailpiece. This will prevent its bonding with the varnish on your instrument. Take care not to change the position of the bridge. When you put your instrument away, you should make sure that it is safely tucked into its case. Also, it should never be left in over-heated cars, on heaters, or exposed to direct sunlight. Protect your instrument from sudden temperature changes and places that have very dry air. The ideal relative humidity is around 60%. Not watching these things can result in glued joints coming apart, cracks developing, or damage to the varnish.